This event is open to all motorsport and car enthusiasts. The event is designed to allow crews to practice navigational skills and to provide an opportunity for the driver and navigator to work together as a team. The even will be particularly useful to those who have entered the Rallye Monte Carlo Historique or Classique. This is the first event run by ERDC – Ecosse Rallye Drivers Club. The event will take the form of an evening Winter Tour and will use some of the excellent roads through Argyll and the Arrochar Alps. The team look forward to meeting old friends and newcomers alike. Access the Regulations and Entry Form hear. The entry fee for the event is £25, which will include a rally plate, competition numbers, other necessary documents. Refreshments will be served after the event. 1 August 2018 - ACM's Monte 2019 Clock is ticking ! Entries open on Monday 27 August 2018. ACM publish the list of 317 starters for the 2018 Historique event with 12 cars leaving from Glasgow. 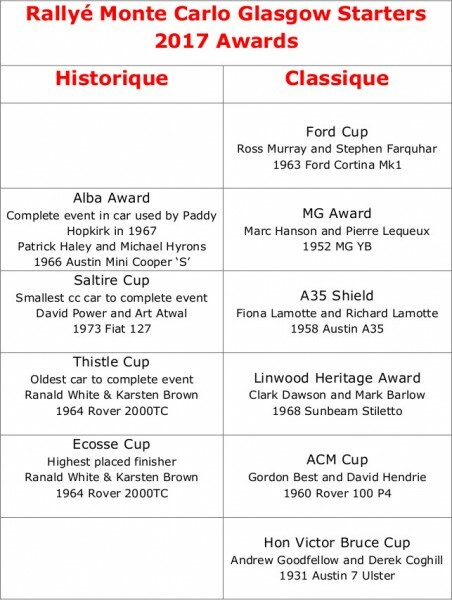 ACM publish the list of 13 starters for the 2018 Classique event with12 cars leaving from Glasgow. Regulations and Entry Forms for the 2018 Monte Heritage Runs are now available, full details in the Heritage section of this website. ACM have just announced that entry documents for the 2018 events will be available to download from their WEB site acm.mc from Monday 4 September 2017. From left to right Melissa Mathieu, Christian Allgeyer, Gerry Mestre, June Anderson, Patricia Beasley, Douglas Anderson. I had a very good meeting with the Automobile Club de Monaco last week and there are some very interesting and exciting new developments for the 2018 Monte. In particular ACM wish to develop the Classique and encourage new entries. They are also keen to develop the route through the UK to make the event more interesting for the competitors and raise the profile of the Monte in the UK. All the indications are looking very good for the 2018 Monte. To date we have had a high level of interest for next year with some interesting cars. Once more the organising committee hope to be able to provide one night free accommodation in the UK for competitors. The 2018 route through France will be different from 2017. After leaving Calais the competitors will drive straight to Valence rather than continuing on to Monte Carlo. This will make it a shorter distance on that section of the Rallye. The regulations and draft itinerary for the Rallye will be published by ACM in July. For 2018 there has been a change in the cut-off date for eligible cars. The cut-off date will be 1969. This opens up a lot more possibilities for suitable cars. The route will be the same as the Historique to Valence, where Classique entrants will have an overnight stop with accommodation and buffet included in the entry fee. After Valence they will follow a traditional Monte route which will incorporate many of the traditional 'cols' including the iconic Col de Turini, before they arrive in Monaco. Entrants will be given cards which can be stamped by the officials at the time/passage controls, but there will be no time penalties and visiting these controls will remain optional. To finish the event off, overnight accommodation and a finish buffet will also be provided in Monte Carlo. I am sure you will agree that at the same cost as in the previous two years, 1500 euro, this is great value for money, with one night accommodation in the UK, two nights accommodation in France, two buffets and the usual goodies. In the previous Monte News Flash we announced that there would be a new Heritage Run in 2018. It may come as a surprise to many of you that Aberdeen was a Start Town for the Monte Carlo Rally before the second world war. In recognition of this, we will have a Heritage Run from Aberdeen to Paisley Abbey, starting on the morning of the Monte Start. The route will take in the Cairn O' Mount and other traditional rally roads. This will give our friends from the north-east the opportunity to enjoy the experience of a Monte Start. There will of course be the traditional Heritage Run to Dumfries along with at least one, possibly two more runs which will be announced at a later stage. Douglas Anderson Co-ordinator Start and UK Leg, Rallye Monte Carlo Historique and Classique. Eight of the nine Historique starters from Paisley Abbey completed all 14 test stages (ZRs) congratulation to all for completing the task and in particular to Ranald White & Karsten Brown who crewed car 296 a 1964 Rover 2000 TC finishing as the best placed UK starters. Our latest Monte get together on Friday 2 December at Glasgow Art Club was a great success and much appreciated. In particular Craig’s ‘teach in’ for Monte newcomers was very informative. Thanks to Craig, Jonathan Lord, Ian and Catherine Higgins, Brian Telfer and of course Glasgow Art Club for making it all possible. The next pre-Monte event is the Col de Ruisg where you will have the opportunity to brush up your skills and try out your car. More information below. The Col de Ruisg will take the form of a Monte-style event over some 50 miles without the competitive element. Using similar mountain roads, you will be able to test your navigation and map plotting skills and practice teamwork between the navigator and driver. The event is open to anyone who would like to do it – whether you have entered the Monte or not. Great news, we have managed to negotiate our night halt at the Olde Bell Inn, Barnby Moor, so instead of staying at Wetherby Services we can go straight to the Passage Control and stay overnight. This should make life much easier for everybody and it is a very comfortable 4 star hotel. 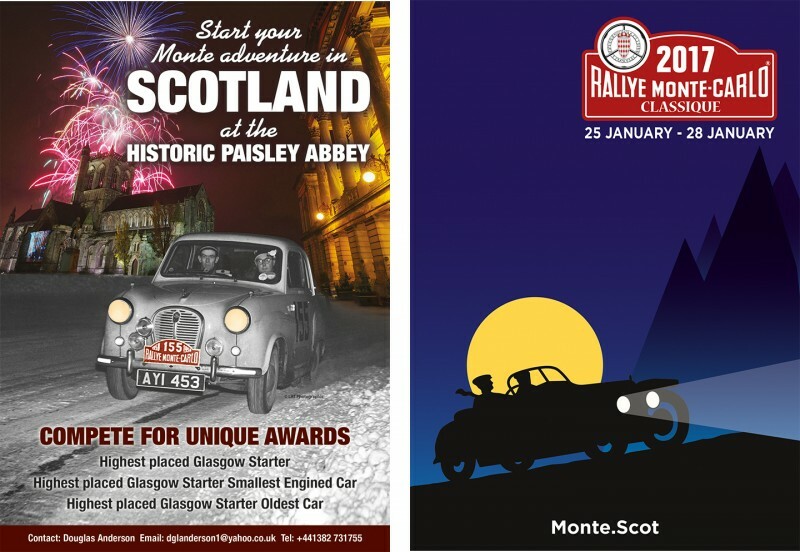 Paisley Abbey is the magnificent backdrop for the Start of the 2017 Rallye Monte Carlo Historique and the Rallye Monte Carlo Classique. The cars will leave the Start Ramp from 6.00pm on 25 January 2017. 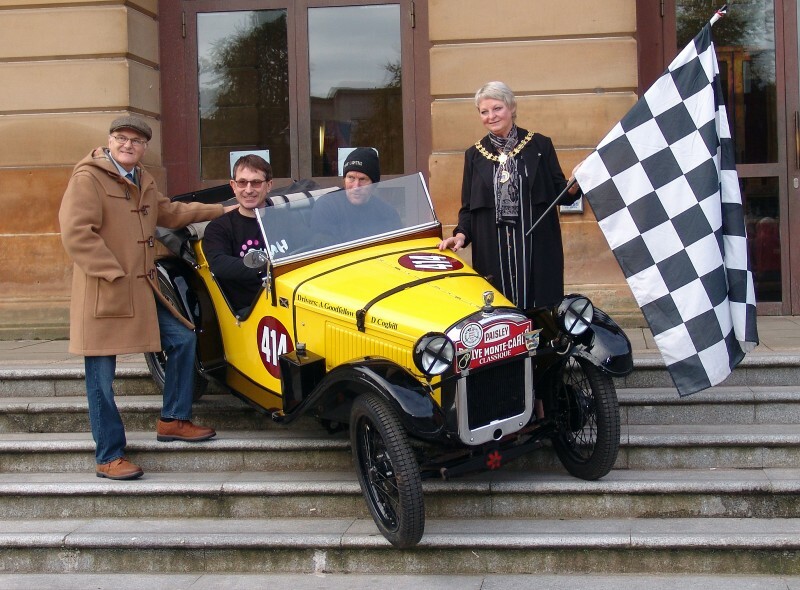 There promises to be a stunning display of classic rally cars as well as entertainment and street food organised by our friends at Renfrewshire Council. The Paisley Abbey Start will once more be the most spectacular of all the Rallye Starts with lights, music, fireworks and a crowd of 10,000 cheering each and every car off the ramp and on their way. This is an event not to be missed. Regulations & Entry Forms for the 2017 Heritage Runs are now available on Heritage Page of this WEB site. 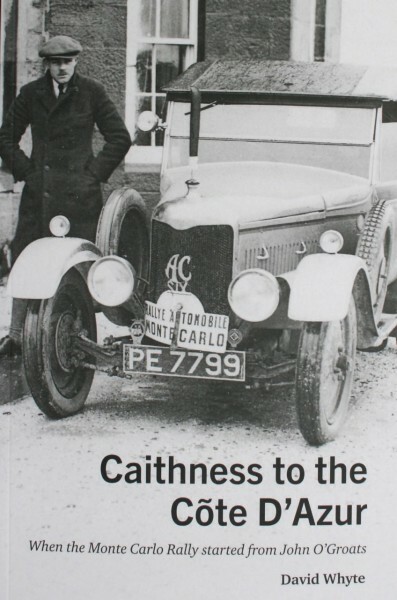 Many excellent books have been written about the Monte Carlo Rally but despite the fact that the first British winner started the rally from Caithness in 1926, the Scottish connection during the pre war years has been largely overlooked. This may be due to the lack of an overall winner from among the John O’Groats starters in subsequent years because of the complex scoring system which made it virtually impossible for them to achieve outright victory. However it was still a considerable feat to complete the non-stop journey from the north of Scotland to the south of France in the depth of winter. The cars were not the specialised racing machines of today - most were identical to the models which customers could buy from the showroom. Many instances of resilience and achievement were shown by more than 200 competitors who started from Caithness in the years up until 1939. Those men and women who took up the challenge of the ‘Monte’ have ensured that John O’Groats has a special place in the history of the most famous rally in the world. This book is a tribute to the skill and determination of the drivers and brings the story up to date with the return of the Monte Carlo Classique event to John O’Groats in 2016.